On 30 November 2016, UNU-IAS Research Fellow Yoshifumi Masago was granted the Award for Asian Young Professional on Water Research at the 12th International Symposium on Southeast Asian Water Environment (SEAWE12). At the same symposium, he presented a research paper titled “Estimating Probability of Infection by Noroviruses in Floodwater: A Case Study in the Ciliwung River Basin”. This research was conducted in Jakarta, Indonesia, one of the eight case studies of the UNU-IAS Water and Urban Initiative. A suite of simulation models for the Ciliwung River Basin has been developed by UNU-IAS researchers. The simulation results have revealed that rapid population increase and urbanization, together with climate change, lead to deterioration of microbial water quality as well as an increase in the intensity of urban floods and probability of noroviruses infection via flood water. There is likely to be a considerable increase in the potential number of people infected, as the simulation results indicate a 86% increase over the next 15 years. 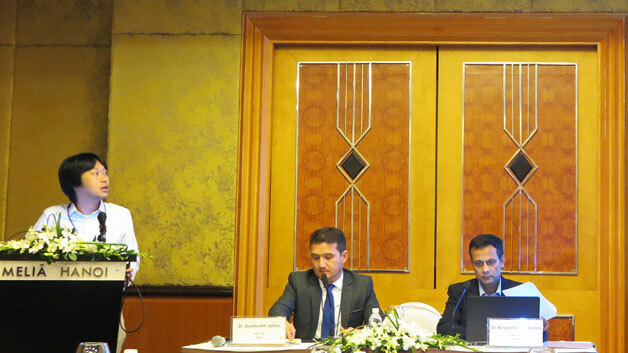 At SEAWE12, UNU-IAS researchers chaired two sessions: “Urban Flood and its Health Consequences” and “Urban Water Quality Management”, and presented their research work focusing on the water environment in Jakarta and Manila.